Alterations in motivation have been implicated in the pathophysiology of several psychiatric disorders, including substance abuse and depression. Repeated exposure to drugs of abuse or stress is known to persistently induce the transcription factor ΔFosB in the nucleus accumbens (NAc) and dorsal striatum, effects hypothesized to contribute to neuroadaptations in dopamine-regulated signaling. Little is known, however, about the specific involvement of ΔFosB in dysregulation of appetitively motivated behaviors. We show here that inducible overexpression of ΔFosB in NAc and dorsal striatum of bitransgenic mice, or specifically in the NAc core of rats by use of viral-mediated gene transfer, enhanced food-reinforced instrumental performance and progressive ratio responding. Very similar behavioral effects were found after previous repeated exposure to cocaine, amphetamine, MDMA [(+)-3,4-methylenedioxymethamphetamine], or nicotine in rats. These results reveal the powerful regulation of motivational processes by ΔFosB, and provide evidence that drug-induced alterations in gene expression via induction of ΔFosB within the NAc core may play a critical role in the impact of motivational influences on instrumental behavior. Repeated drug exposure causes temporally dynamic alterations in gene transcription that produce lasting neuroadaptations within the nucleus accumbens (NAc) (Nestler, 2004). This brain region plays a critical role in both drug and natural reinforcement processes (Kelley and Berridge, 2002), although little is known about the transcription factors that impact on behavior motivated by nondrug, appetitive reinforcers such as food. ΔFosB is a transcription factor activated within the NAc and dorsal striatum by chronic drug exposure (Konradi et al., 1994; Nye et al., 1995; Chen et al., 1997; Pich et al., 1997; Shaw-Lutchman et al., 2003) and compulsive wheel-running (Werme et al., 2002). It is also induced in these regions by several forms of chronic stress (Perrotti et al., 2004). The enhancement of drug reinforcement processes associated with induction of striatal ΔFosB is well established (Kelz et al., 1999; Colby et al., 2003; Zachariou et al., 2006). The consequences of elevated ΔFosB levels in these regions on instrumental behavior motivated by natural reinforcers are, however, not known. The performance of instrumental responses is a necessary component of drug-taking behavior that can become dysregulated or inflexible as the transition to addiction progresses (Jentsch and Taylor, 1999; Berke and Hyman, 2000; Berridge and Robinson, 2003; Everitt and Robbins, 2005). The NAc is involved in multiple aspects of instrumental behavior with relevance for addiction (Balleine and Killcross, 1994; Corbit et al., 2001; de Borchgrave et al., 2002; Di Ciano and Everitt, 2004b; Everitt and Robbins, 2005). It is therefore likely that drug-induced neuroadaptations within the NAc could affect performance of instrumental actions. Indeed, chronic cocaine exposure enhances sucrose-reinforced instrumental performance (Miles et al., 2004) and manipulations thought to block neuroplasticity within the NAc core, including inhibition of PKA (protein kinase A) or protein synthesis, interfere with food-rewarded instrumental responses (Baldwin et al., 2002a; Hernandez et al., 2002). The NAc core also mediates the motivational impact of conditioned influences on instrumental behavior (Parkinson et al., 1999; Corbit et al., 2001; Hall et al., 2001; Di Ciano and Everitt, 2004a; Ito et al., 2004), providing a neurobiological substrate whereby ΔFosB induction might powerfully affect instrumental performance and motivation for appetitive reinforcers such as food, water, or drugs of abuse. Here, we investigated the effects of ΔFosB on food-motivated instrumental behavior using two complementary genetic approaches: (1) inducible overexpression of ΔFosB within the NAc and dorsal striatum of bitransgenic mice (NSE-tTA × TetOp-ΔFosB) and (2) overexpression of ΔFosB in the NAc core specifically by use of viral-mediated gene transfer in rats. We also evaluated whether previous repeated exposure to cocaine, amphetamine, (+)-3,4-methylenedioxymethamphetamine (MDMA), or nicotine, under conditions reported to increase ΔFosB, would enhance food-reinforced instrumental responding and/or motivation using a progressive ratio schedule, as has been shown for drug-reinforced self-administration (Horger et al., 1990, 1992; Piazza et al., 1990; Vezina et al., 2002; Miles et al., 2004). Our results demonstrate persistent effects of ΔFosB on instrumental behavior and suggest that this transcription factor may act in the NAc core as a regulator of motivational function. Experimentally naive Sprague Dawley rats were acquired from Charles River Laboratories (Wilmington, MA). Male bitransgenic 11A mice were derived from a cross between homozygous transgenic mice expressing a neuron-specific enolase (NSE)-tTA tetracycline transactivator protein (line A) and mice expressing TetOp (tetracycline-responsive promoter)-ΔFosB (line 11); the parental lines were maintained on an outbred mixed background (50% ICR and 50% C57BL6 × SJL) (Chen et al., 1998; Kelz et al., 1999). These bitransgenic 11A mice express ΔFosB only when: (1) both transgenes are present in the same cell, and (2) the transcriptional activation by tTA is not inhibited by the presence of tetracycline antibiotics such as doxycycline. The administration of doxycycline to these mice can thus exert a temporal control over the expression of ΔFosB and be used to prevent the expression during development; indeed, doxycycline administration is associated with no detectable leak expression of ΔFosB (Chen et al., 1998; Kelz et al., 1999). Moreover, the 11A line of bitransgenic mice were chosen for the present experiments, because they display an expression pattern that is primarily restricted to dynorphin-containing striatal neurons (both NAc and dorsal striatum), very similar to the pattern of ΔFosB induction by chronic drug exposure (Kelz et al., 1999). Moreover, the quantification of this striatal expression of ΔFosB has been quantified previously (Chen et al., 1998; Kelz et al., 1999). The mice were generated at University of Texas Southwestern and maintained and tested in the Yale facilities. Throughout gestation and development, all mice were maintained on doxycycline until 8–9 weeks of age at a concentration of 100 μg/ml in the drinking water, conditions known to maintain TetOp-driven transgenes in the “off” state, and used starting 6 weeks off doxycycline when ΔFosB expression becomes maximal (Kelz et al., 1999). All experiments involved the comparison of littermate bitransgenic mice on versus off doxycycline, which by itself has no effect on motivated behavior (Kelz et al., 1999; McClung and Nestler, 2003; Zachariou et al., 2006). All experimental subjects were housed in pairs (rats) or in groups (mice; four to five per cage) under controlled temperature and humidity conditions under a 12 h light/dark cycle (light on at 7:00 A.M. and off at 7:00 P.M.). They were allowed at least 7 d to adjust to the housing facilities before any study. Animals had ad libitum access to water at all times and limited access to food as detailed below. All animal use was conducted in accordance with the National Institutes of Health Guide for the Care and Use of Laboratory Animals and was approved by the Animal Care and Use Committees at University of Texas Southwestern and Yale University. Cocaine hydrochloride [kindly provided by the National Institute on Drug Abuse (NIDA)], d-amphetamine sulfate (Sigma, St. Louis, MO), MDMA hydrochloride (kindly provided by NIDA), and (−)-nicotine hydrogen tartrate (Sigma) were dissolved in sterile physiological saline (0.9%) and injected intraperitonally at a volume of 5 ml/kg (mice) or 2 ml/kg (rats). The pH of the nicotine solution was adjusted with sodium bicarbonate before injection. Viral-mediated gene transfer was performed as previously described (Carlezon et al., 1998; Perrotti et al., 2004). In short, cDNAs encoding the specific proteins were inserted into the herpes simplex virus (HSV) amplicon HSV-PrPUC and packaged into the virus using the helper 5dl1.2. The vectors driving expression of either HSV-LacZ, coding for the control protein β-galactosidase, or HSV-ΔFosB, coding for ΔFosB, were subsequently infused into the NAc core according to the experimental protocol. Experiment 1 examined the effects of previous repeated drug exposure on food-reinforced instrumental performance and progressive ratio responding. Rats were randomly divided into five experimental groups (n = 9–10/group). These groups received twice daily injections (intraperitoneally; at 9:00 A.M. and 5:00 P.M.) with saline or one of the following drugs: nicotine, 0.35 mg/kg; MDMA, 2.5 mg/kg; cocaine, 15 mg/kg; or amphetamine, 2.5 mg/kg for 15 consecutive days. The doses were selected based on our previously published data (Taylor and Jentsch, 2001; Olausson et al., 2003), and the drug-induced locomotor stimulation was monitored on treatment days 1 and 15. 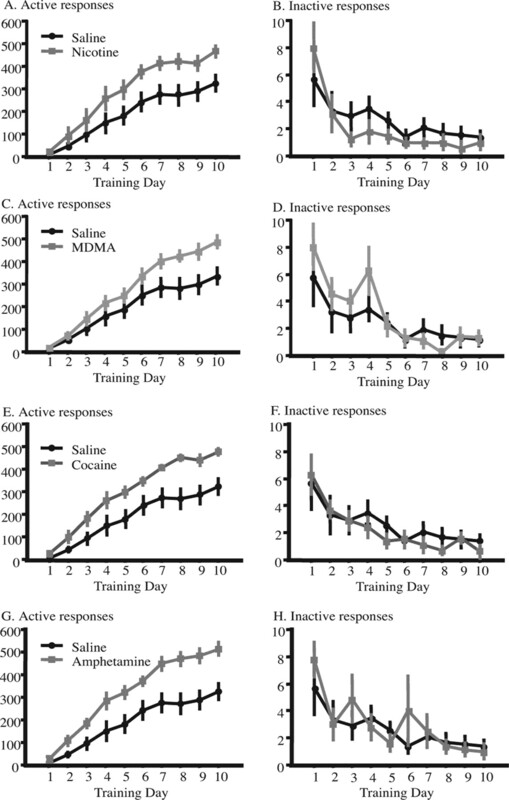 After 5 d of withdrawal, animals were trained on instrumental responding for 10 consecutive days and subsequently tested on progressive ratio responding on the next day. Two animals were excluded from the statistical analysis because they did not acquire the instrumental response, making no more than one active lever response on each of the three final training sessions. Experiments 2 and 3 examined the effects of inducible striatal overexpression of ΔFosB in bitransgenic mice on instrumental performance and responding on a progressive ratio of reinforcement. The inducible overexpression of ΔFosB in these mice has previously been demonstrated to mimic the effects of repeated drug exposure in the locomotor activity and conditioned place preference paradigms (Kelz et al., 1999; Zachariou et al., 2006). These mice can provide critical information about the contribution of striatal ΔFosB to specific behavioral processes. Genotyped male mice were maintained on doxycycline or were switched to tap water at 8 weeks of age. Experiments were initiated after 6 weeks of doxycycline withdrawal, at which time transgene expression is maximal (Kelz et al., 1999). In experiment 2, animals (n = 16) were food restricted and trained on the instrumental procedure described below (see below, Instrumental responding and progressive ratio testing) for 10 consecutive days. After the completion of instrumental testing, cocaine-induced locomotor stimulation was evaluated in these mice. In experiment 3, a separate group of mice (n = 18) were trained on the instrumental response for 10 consecutive days under conditions during which a maximum of 50 reinforcers were delivered. On day 11, all mice were tested on progressive ratio responding. On day 12, we determined the effects of reinforcer devaluation by prefeeding on progressive ratio responding. Experiments 4 and 5 examined the effects of viral-mediated overexpression of ΔFosB specifically within the NAc. Experiment 4 tested the effects of ΔFosB overexpression on instrumental performance. Here, rats were infused with HSV-ΔFosB (n = 8) or HSV-LacZ (n = 8) in the NAc core and trained on the instrumental procedure beginning 40 h later. After 10 daily training sessions, baseline activity levels were assessed for all animals in the locomotor activity monitoring equipment as described below (see below, Locomotor activity). Experiment 5 evaluated the effects of NAc ΔFosB overexpression specifically on progressive ratio responding. Here, the rats were initially trained for 15 consecutive days, assigned to experimental groups, and subsequently infused with HSV-ΔFosB (n = 8) or HSV-LacZ (n = 7) in the NAc core. Animals were left untested and untreated for 4 d to allow for ΔFosB expression to peak. On day 5 after infusion, all animals were tested for lever pressing on the progressive ratio schedule. After the last day of testing, all rats were killed and the placement of infusion cannulas in the NAc core verified histochemically. Based on the placement of infusion cannulas, two rats were excluded from experiment 4 and one rat from experiment 5. Characterization of gene expression was made in a separate group of animals. Here, HSV-LacZ was infused into the NAc core and animals were killed 3 d later. The expression of β-galactosidase was subsequently assessed immunohistochemically. Locomotor activity was measured using activity meters (Digiscan animal activity monitor; Omnitech Electronics, Columbus, OH). The activity meters were equipped with two rows of infrared photosensors, each row consisting of 16 sensors placed 2.5 cm apart. The activity meters were controlled by and data from the activity meters collected by a PC computer using the Micropro software (Omnitech Electronics). The experimental animals were placed in transparent plastic boxes (25 × 45 × 20 cm) that were put into the activity meters. Animals were initially allowed to habituate to the locomotor activity recording equipment for 30 min. In some experiments, animals were subsequently taken out, injected with cocaine, amphetamine, nicotine, or vehicle according to the experimental design, and placed back into the boxes. The locomotor activity was then recorded for 60 min, starting 5 min after drug injection to avoid nonspecific injection-induced hypermotility. All experiments were performed during the animals’ light phase (between 9:00 A.M. and 6:00 P.M.). Instrumental responding was assessed using standard operant chambers for rats (30 × 20 × 25 cm) or mice (16 × 14 × 13 cm) controlled by the MedPC software (Med Associates, St. Albans, VT). Each chamber was housed in a sound-attenuating outer chamber equipped with a white noise generator and a fan to reduce the impact of external noise. A house light mounted on the back wall illuminated the chamber. A pellet dispenser delivered food pellets (20 or 45 mg; Bio-Serv, Frenchtown, NJ) as the reinforcer into the magazine. Head entries were detected by a photocell mounted above the reinforcer receptacle. In this magazine was a stimulus light. For rats, one lever was placed on each side of the magazine. For mice, two nosepoke apertures were placed on the back wall of the chambers (i.e., opposite to the reinforcer magazine). During the 5 d immediately before the start of training, animals were restricted to 90 min access to food per day and exposed to grain-based food pellets (mice, 20 mg; rats, 45 mg) in their home cages. During the testing period, food pellets were intermittently available in the operant chambers according to the behavioral protocol (see below) as well as in unlimited amounts in the home cage for 90 min, beginning 30 min after the daily testing session. This food access schedule allows for each individual animal to reach their individual satiety point and reduces the variability caused by competition between dominant and subordinate animals. In our hands, this schedule allows for a slow weight gain after the initial weight loss to ∼85–90% of free-feeding weights. Animal weights were monitored throughout the experiment. All subjects were initially habituated to the testing apparatus for 2 d; during these sessions, food pellets were delivered into the reinforcer magazine on a fixed-time 15 s (FT-15) schedule. Beginning on the next day, the subjects received daily training sessions for 10 consecutive days. Responding for food was tested based on previously published instrumental conditioning procedures (Baldwin et al., 2002b). Responding on the correct (i.e., active) lever/nosepoke was reinforced, whereas responding on the other (inactive) lever/nosepoke had no programmed consequences. The position of the active nosepoke or lever (left/right) was balanced for all experimental groups. Completion of the response requirement (see below) resulted in onset of the magazine stimulus light, followed 1 s later by delivery of a single food pellet. Two seconds later, the stimulus light was turned off. The first 10 reinforcers were obtained after successful completion of responding according to a fixed ratio (FR1) schedule, after which pellets were available after responding on a variable ratio (VR2) schedule. The session lasted for 15 min. Experiments 3 (mice) and 5 (rats) used alternative training schedules to avoid the potential impact of differences in instrumental performance during training on subsequent progressive ratio responding (detailed below). In experiment 3, mice were trained on a FR1 schedule for 2 d and then on an FR2 schedule for 8 d. The first 3 d of testing used 60 min sessions. On the last 7 training days, the session was terminated when 50 reinforcers had been acquired. In experiment 5, rats were trained on the FR1/VR2 schedule in 15 min sessions as described above for all other experiments with two exceptions. First, a maximal number of 150 pellets/session was delivered. Second, these animals received 5 additional days of training (i.e., a total of 15 d) to allow for the establishment of stable performance before any experimental manipulation. Animals were also tested on responding for food on a progressive ratio schedule of reinforcement. In this test, the response requirement to obtain food was initiated as a FR1 schedule but progressively increased by 2 to obtain a subsequent reinforcer (i.e., 1, 3, 5, 7…, X + 2 responses). In the drug treatment experiment using rats, the schedule was progressively increased by 5, yielding a final schedule of 1, 6, 11, 16…, X + 5. All other parameters were kept identical to the training procedure detailed above. The test was terminated when no active response had been made for 5 min. The effect of reinforcer devaluation was examined using reinforcer-specific prefeeding. Here, mice were allowed to eat unlimited grain-based food pellets in their home cage during 3 h before testing on the progressive ratio schedule of reinforcement as described above. Animals were anesthetized using Equithesin [a mixture containing pentobarbital (35 mg/kg) and chloral hydrate (183.6 mg/kg) in ethanol (10% v/v) and propylene glycol (39% v/v); administered at 4.32 ml/kg, i.p.]. Cannulas (Plastics One, Roanoke, VA) were surgically implanted aimed above the NAc core, using Kopf stereotactic equipment. The stereotactic coordinates used relative to bregma were as follows: anterior/posterior, +1.5 mm; lateral/medial, ±1.5 mm; ventral/dorsal, −6.0 mm (Paxinos and Watson, 1986). The cannulas were anchored to the skull using screws and dental cement. Obturators were placed into the guide cannulas to prevent blocking. After surgery, animals were subjected to standard postoperative care and were allowed to recover for 5 d before the start of any experiment. Intracerebral infusions of viral vectors were performed bilaterally 40 h before the onset of training (see below). Injection syringes (31 gauge), extending 1 mm below the tip of the guide cannulas, were slowly lowered simultaneously into the left and the right NAc, and 1.0 μl/side was infused over a 4 min period at an infusion rate of 0.25 μl/min using a microinfusion pump (PHD-5000; Harvard Apparatus, Holliston, MA). The infusion needles were left in place for 1 min after the infusion was completed, and the dummy cannulas were replaced. Cannula placements were histologically verified after the completion of the behavioral experiments (see Fig. 6B), and only animals with correctly placed cannulas were included in the statistical analysis of the experimental data. After the completion of the experiments, animals that had received surgeries as part of the experiment were anesthetized with Equithesin and perfused transcardially with 0.1 m PBS (5 min) and 10% formalin (10 min) according to standard procedures. Brains were postfixed in formalin and subsequently placed in a phosphate-buffered sucrose solution (30%). All brains were then cut in 40 μm sections on a microtome and used for histological analyses of cannula placement and protein expression. Cannula placement was made in sections counterstained with neutral red and mounted on microscope slides in distyrene plasticizer and xylene (DPX) after ethanol dehydration. Immunohistochemistry was performed as previously described (Hommel et al., 2003). In short, expression of β-galactosidase after HSV-LacZ infusion was determined by immunofluorescent staining using a goat anti-β-galactosidase primary antibody (1:5000; Biogenesis, Kingston, NH). After overnight incubation, sections were rinsed and subsequently incubated with a fluorescent donkey anti-goat secondary antibody conjugated to Cy2 (1:200; Jackson ImmunoResearch, West Grove, PA). Sections were washed again followed by ethanol dehydration and mounting in DPX. Adjacent control sections were treated identically without the inclusion of primary antibodies. Immunofluorescence was assessed at 520 nm using a Zeiss (Oberkochen, Germany) microscope with FITC filter and images captured at identical exposure times with Zeiss Axiovision digital imaging system. The data from all experiments were evaluated using a one-, two-, or three-way ANOVA followed by Scheffe's or Dunnett's post hoc test, correcting for multiple comparisons where appropriate using Holm's sequential rejection test. A value of p ≤ 0.05 was considered statistically significant. To confirm that our repeated drug exposure paradigm produced functionally significant neuroadaptations, we first assessed locomotor sensitization as a prototypical behavioral measure of chronic drug action. Rats were given twice daily injections of nicotine (0.35 mg/kg), MDMA (5 mg/kg), cocaine (15 mg/kg), or amphetamine (2.5 mg/kg), and locomotor activity was tested after the first injection on treatment days 1 and 15 (supplemental Fig. 1A–E, available at www.jneurosci.org as supplemental material). Statistical analysis revealed a significant treatment by day interaction (F(4,42) = 9.335; p ≤ 0.0001). With the exception of MDMA (p = 0.62), all drugs induced significantly greater locomotor activity (i.e., sensitization) on day 15 compared with day 1 (nicotine, p ≤ 0.001; cocaine, p ≤ 0.001; amphetamine, p ≤ 0.01). Repeated saline injections had no effect. None of the drug treatments altered baseline locomotor activity measured during the habituation period on day 15 (supplemental Fig. 2A, available at www.jneurosci.org as supplemental material). Five days after the last drug injection, we examined the effects of previous repeated nicotine, MDMA, cocaine, or amphetamine exposure on food-reinforced instrumental behavior. The data are presented for each drug separately in Figure 1A–H using the same saline control group for comparisons. We found that previous exposure to each of these drugs significantly and selectively increased food-reinforced instrumental responding (treatment by lever by training day, F(36,378) = 1.683; p ≤ 0.01; post hoc analysis: nicotine, p ≤ 0.01; MDMA, p ≤ 0.05; cocaine, p ≤ 0.01; amphetamine, p ≤ 0.001). The persistent elevation in instrumental responding observed at asymptotic performance suggested a possible enhancement in motivation, consistent with previously reported increases after repeated psychostimulant exposure (see Discussion). We therefore tested whether previous repeated drug exposure enhanced motivation using a progressive ratio schedule. There was a statistical effect of previous drug exposure on responding on the active lever (treatment by lever interaction, F(4,42) = 3.340; p ≤ 0.05) (Fig. 2A) as well as the final break point (F(4,42) = 5.560; p ≤ 0.001) (Fig. 2B). Additional analysis showed that all treatments increased both the number of active responses (nicotine, p ≤ 0.001; MDMA, p ≤ 0.05; cocaine, p ≤ 0.001; amphetamine, p ≤ 0.001) and the break point (nicotine, p ≤ 0.001; MDMA, p ≤ 0.01; cocaine, p ≤ 0.0001; amphetamine, p ≤ 0.0001) consistent with an effect of these treatments on motivation. Given the lack of effect of the drugs on baseline locomotor activity, and the lack of effect on inactive lever presses, it is unlikely that the increased responding for food under these conditions reflects nonspecific increases in motor activity. Effect of previous repeated injections of nicotine (0.35 mg/kg), MDMA (2.5 mg/kg), cocaine (15 mg/kg), or amphetamine (2.5 mg/kg) twice daily for 15 d on subsequent instrumental behavior. The animals were tested together, but for clarity the effects of each drug are presented separately, using the same saline-treated control group. A (active responses) and B (inactive responses) show the effects of previous nicotine exposure; C, D, MDMA; E, F, cocaine; G, H, amphetamine. Data are represented as means ± SEM. Previous drug exposure also had no effect on body weight recorded before food restriction, on the first or last day of instrumental training, or immediately before the progressive ratio test (supplemental Fig. 2B, available at www.jneurosci.org as supplemental material). The restricted food access for 3 d did initially reduce body weight to on average 91–92% of free-feeding weights. At the end of behavioral testing, weights had returned to 97–99% of prerestriction body weight, and no differences were observed between drug-exposed and saline-treated animals. Alterations in body weight and differences in hunger or appetite should thus not contribute significantly to the observed enhancement of instrumental performance or motivation. We next examined whether instrumental performance was also increased in bitransgenic mice that inducibly overexpress ΔFosB with marked selectivity in the NAc and dorsal striatum (Kelz et al., 1999). In this experiment, ΔFosB-overexpressing mice were compared with littermate controls that do not overexpress ΔFosB because they are maintained on doxycycline (see Materials and Methods). We found that overexpression of ΔFosB significantly increased food-reinforced responding (gene expression by lever by training day, F(9,126) = 3.156; p ≤ 0.01) (Fig. 3A). The number of nosepoke responses made in the inactive aperture was not different between the two groups (Fig. 3B). Together, these data indicate that ΔFosB overexpression in NAc and dorsal striatum selectively increased instrumental performance. Effect of inducible striatal overexpression of ΔFosB in bitransgenic mice on instrumental performance. A, Active responses. B, Inactive responses. Data are represented as means ± SEM. To rule out that the enhancement of instrumental performance in ΔFosB-overexpressing animals could be explained by alterations in appetite or hunger, body weight was recorded before food restriction and on the first and last days of training. ΔFosB had no effect on body weight before food restriction, nor was there an effect on body weight during behavioral testing. Here, restricted food access for 3 d reduced body weight to an average of 87–89% of free-feeding weights. At the end of behavioral testing, animal weights were 97–99% of prerestriction body weights, with equivalent changes seen in the ΔFosB and control mice (supplemental Fig. 3A, available at www.jneurosci.org as supplemental material). It is thus unlikely that potential effects of ΔFosB overexpression on hunger or appetite could account for enhancements in instrumental responding observed. When testing on instrumental performance had been completed, ΔFosB overexpression did not alter baseline locomotor activity measured during a 30 min period (supplemental Fig. 3B, available at www.jneurosci.org as supplemental material). This observation supports the view that nonspecific alteration in activity does not contribute to the enhanced instrumental performance observed in these animals. However, ΔFosB-overexpressing bitransgenic mice have been reported to exhibit enhanced locomotor responses to acute and repeated cocaine (Kelz et al., 1999). Because we used a slightly different schedule of withdrawal from doxycycline to induce gene expression (6 weeks with food restriction), we set out to confirm this phenotype. Indeed, ΔFosB-overexpressing mice demonstrated a significantly greater increase in locomotor activity when injected with cocaine compared with their littermate controls maintained on doxycycline (treatment by gene expression, F(1,44) = 4.241; p ≤ 0.05) (supplemental Fig. 3C, available at www.jneurosci.org as supplemental material). Given that previous drug exposure induces striatal ΔFosB (Nestler et al., 2001) and was found here to increase progressive ratio responding, we next tested whether transgenic striatal overexpression of ΔFosB also increases performance on a progressive ratio schedule of reinforcement. A new group of mice were trained on instrumental responding under conditions (see Materials and Methods) that did not produce significant differences in instrumental performance before testing on progressive ratio responding (F(1,16) < 1). However, in the progressive ratio test we observed a significant gene expression by lever interaction (F(1,16) = 5.30; p ≤ 0.05) (Fig. 4A) and found that ΔFosB-overexpressing mice, compared with littermate control mice maintained on doxycycline, made a greater number of active responses (p ≤ 0.05), whereas the number of inactive lever responses was not different. ΔFosB-overexpressing mice also reached a higher break point (F(1,16) = 5.73; p ≤ 0.05) (Fig. 4B). These data suggest that, like previous psychostimulant exposure, striatal overexpression of ΔFosB increases motivation. Because the number of inactive responses was not altered in the ΔFosB-overexpressing mice, nonspecific increases in activity are not likely to contribute to these effects. This view was further supported by assessments of baseline locomotor activity in which there was no difference between mice overexpressing ΔFosB and littermate control mice maintained on doxycycline. No gross differences in body weight between ΔFosB-overexpressing and control animals were evident as measured on the test day. Thus, although ΔFosB-overexpressing animals will emit more food-motivated instrumental responses, they do not appear to consume more food when it is freely available. The most likely explanation for this observation is that, although motivation determines how hard an animal will work to acquire a reinforcer, numerous additional factors (appetite, satiety, metabolic state, etc.) influence feeding behavior and the actual consumption of food. The ΔFosB bitransgenic mice used here express ΔFosB throughout the striatum. Whereas the ventral striatum (including the NAc) has been implicated in motivational processes, the dorsal striatum is argued to be involved in the acquisition of instrumental habits (Yin et al., 2004; Faure et al., 2005). Although we did not observe differences in instrumental performance during the training phase using a low ratio schedule with maximal reinforcement limits, conditions relatively resistant to the development of instrumental habits (Dickinson, 1985), it is possible that the establishment of habits could influence responding under the progressive ratio schedule. This possibility was tested directly by evaluating the effect of reinforcer devaluation by prefeeding on progressive ratio responding. Such prefeeding obliterated the effect of ΔFosB on progressive ratio responding, with no differences in responding or break points observed between ΔFosB-overexpressing and control mice (F(1,16) < 1) (Fig. 4C,D). Together, these data suggest that striatal overexpression of ΔFosB did not alter the sensitivity to changes in the value of rewarded outcomes using this testing schedule. 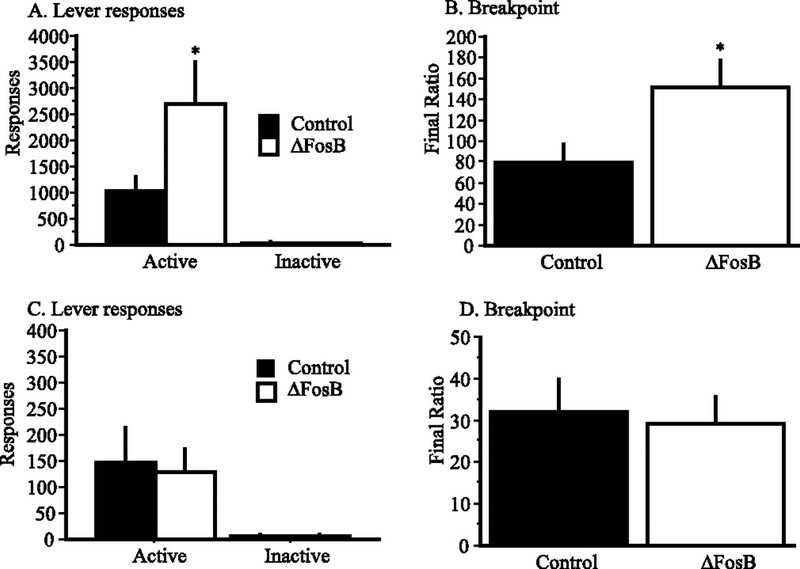 Rather, the instrumental responding observed in the progressive ratio test appears to be goal-directed and the increased break point observed in ΔFosB-overexpressing mice is likely attributable to augmented motivation and not to elevated habit-like responding. To assess whether ΔFosB overexpression selectively in the NAc could account for the behavior observed in the bitransgenic mice, we infused HSV-ΔFosB, or HSV-LacZ as a control, selectively into the NAc core of rats and studied the effect of this manipulation on food-reinforced instrumental performance (Fig. 5A,B). After magazine training, HSV-ΔFosB or HSV-LacZ was infused into the NAc core 40 h before the initiation of behavioral testing. The location of the infusion and the extent of viral-mediated gene expression are shown in Figure 6, A and B. NAc infusions of HSV-ΔFosB produced a sustained increase in the number of active responses made (gene expression by lever, F(1,12) = 8.534; p ≤ 0.05) (Fig. 5A), which persisted throughout the experiment. These effects were selective, because there were no significant effects of ΔFosB overexpression within the NAc core on the number of inactive responses (Fig. 5B) or on baseline locomotor activity recorded the day after the completion of the experiment (data not shown). Overexpression of ΔFosB in the NAc thus mimicked the behavioral effects of previous drug exposure or striatal overexpression of ΔFosB. A, Placements of infusion sites for the viral vector experiments. Top, The filled black circles correspond to the intended infusion site. Only infusions made within ∼0.5 mm of this area (i.e., within the NAc core), as indicated by the circle, were considered acceptable. Animals with infusions made outside of this area were excluded from statistical analyses. Bottom, Infusion site within the NAc in a representative animal. B, Immunohistochemical verification of protein expression after infusion of HSV-LacZ. The top panels demonstrate β-galactosidase expression within the NAc core (2.5 and 10× magnification). The bottom panels demonstrate the lack of immunofluorescence in adjacent control sections using the same immunohistochemical procedure without the inclusion of the primary antibody. The final experiment directly determined whether restricted overexpression of ΔFosB in the NAc core using the viral-mediated gene transfer approach was sufficient to enhance motivation in rats. Here, HSV-ΔFosB was infused only after instrumental training had been completed, eliminating any potential influence of ΔFosB overexpression during training on the subsequent progressive ratio test. A new group of rats were trained, as before, and divided into balanced experimental groups based on their performance on the final days of training. Animals subsequently received bilateral infusions of HSV-ΔFosB or HSV-LacZ into the NAc core and were tested on progressive ratio responding after 5 d of overexpression. Statistical analysis revealed a significant gene expression by lever interaction (F(1,12) = 14.91; p ≤ 0.01) (Fig. 7A). Rats infused with HSV-ΔFosB made more active responses (p ≤ 0.01) compared with those infused with HSV-LacZ, whereas responding on the inactive lever was not affected. Consistent with this increase, rats infused with HSV-ΔFosB also had a higher break point (F(1,12) = 18.849; p ≤ 0.001) (Fig. 7B) than animals infused with HSV-LacZ. There was no effect of ΔFosB on baseline locomotor activity tested 1 h before the progressive ratio test (supplemental Fig. 4A, available at www.jneurosci.org as supplemental material). There were also no differences in body weight on the day of progressive ratio testing (supplemental Fig. 4B, available at www.jneurosci.org as supplemental material). These findings support our observations with transgenic ΔFosB-overexpressing mice, and indicate that selective overexpression of ΔFosB in the NAc is sufficient to enhance food-associated motivation. Effect of infusions of HSV-ΔFosB 5 d before testing on instrumental responding on a progressive ratio schedule of reinforcement. A, Lever responses. B, Break point. Data are represented as means ± SEM. ***p < 0.001; **p < 0.01. The present study demonstrates that overexpression of ΔFosB within the NAc enhances food-reinforced instrumental behavior. Previous exposure to cocaine, amphetamine, MDMA, or nicotine enhanced produced a lasting increase in subsequent instrumental performance. These drug exposures also increased food-motivated behavior under a progressive ratio schedule of reinforcement. These effects of previous drug exposure were mimicked by restricted overexpression of ΔFosB in the striatum, using inducible bitransgenic (NSE-tTA × TetOP-ΔFosB) mice or using a novel viral vector to express ΔFosB selectively in the NAc. Notably, overexpression of ΔFosB in the NAc core, after instrumental responding had already been acquired, enhanced motivation for food under the progressive ratio schedule. Together, our findings identify ΔFosB in the NAc core as a potential mediator of drug-induced neuroadaptations that can promote instrumental behavior, extending the role for this transcription factor to include processes with relevance to motivational influences on the performance of food-reinforced behavior. They also raise the possibility that conditions that induce ΔFosB expression in the NAc may influence the motivational properties of both natural and drug reinforcers. 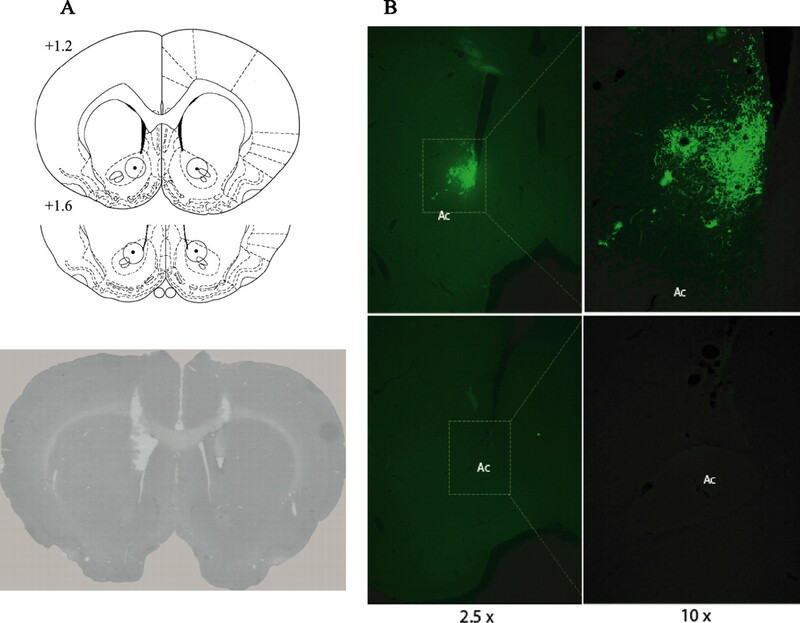 ΔFosB accumulates in dynorphin-expressing medium spiny neurons of both the NAc and dorsal striatum after chronic, but not acute, exposure to drugs of abuse. This regional pattern of expression is reproduced in the inducible bitransgenic ΔFosB-overexpressing mice used here. In these mice, elevated striatal levels of ΔFosB increase the animals' sensitivity to cocaine and morphine as measured by conditioned place preference (Kelz et al., 1999; Zachariou et al., 2006). It also augments progressive ratio responding for cocaine suggesting that motivation to self-administer cocaine is enhanced by striatal ΔFosB overexpression (Colby et al., 2003). Here, we found that striatal ΔFosB overexpression in these mice also increased progressive ratio responding for a food reinforcer and that these effects were reproduced by restricted viral-mediated overexpression of ΔFosB in the NAc core in rat. Our data suggest that ΔFosB may act as a transcriptional modulator of motivation for primary reinforcers, be they food, drugs, or perhaps exercise, an idea consistent with preliminary observations that striatal expression of ΔFosB is increased after chronic wheel running or sucrose drinking (McClung et al., 2004). These data suggest that NAc overexpression of ΔFosB can enhance the motivational impact of both natural and drug reinforcers. Subregions of the NAc have been argued to differentially mediate the influence of pavlovian or instrumental incentive processes on instrumental performance (Corbit et al., 2001; de Borchgrave et al., 2002), whereas more general motivational influences on instrumental performance may be encoded by other regions such as the central nucleus of the amygdala (Corbit and Balleine, 2005). The NAc core has, however, also been proposed to be a critical site for acquisition of goal-directed instrumental learning (Smith-Roe and Kelley, 2000; Baldwin et al., 2002a,b; Kelley, 2004). We show equivalent effects of previous drug exposures and transgenic striatal ΔFosB overexpression on enhancing instrumental behavior. Infusions of HSV-ΔFosB restricted to the NAc core also increased food-reinforced instrumental responding. Although these experiments do not exclude a contribution of the dorsal striatum in these behaviors, they strongly suggest that ΔFosB-induced alterations in gene expression within the NAc are sufficient to increase food-motivated responding. Because progressive ratio responding was also enhanced when ΔFosB was expressed after stable instrumental performance had previously been achieved, a role for motivational influences on instrumental behavior seems likely. The possibility that our manipulations also affect instrumental learning processes can, however, not be completely excluded. In support of our conclusions, the increase in instrumental performance observed after previous oral cocaine exposure (Miles et al., 2004) has been argued to involve motivational alterations consistent with the ability of chronic nicotine treatment to increase progressive ratio responding in mice (Brunzell et al., 2006). Furthermore, dopamine transporter knock-out mice, in which extracellular dopamine levels are increased, display both enhanced ΔFosB immunoreactivity and food-reinforced motivation, but not altered learning (Cagniard et al., 2006). Moreover, we found that overexpression of striatal ΔFosB in mice did not affect performance when food was “devalued” by prefeeding. These data indicate that animals were sensitive to the motivational value of the reinforcer and that responding was goal directed. Previous repeated drug exposure can also enhance behavioral control exerted by conditioned stimuli associated with natural reinforcers, measured by pavlovian approach (Harmer and Phillips, 1998; Taylor and Jentsch, 2001; Olausson et al., 2003), conditioned reinforcement (Taylor and Horger, 1999; Olausson et al., 2004), and pavlovian-to-instrumental transfer (Wyvell and Berridge, 2001). There is now compelling evidence that the NAc core, as opposed to the shell, is involved in the control of drug-motivated behavior by pavlovian conditioned stimuli (Parkinson et al., 1999, 2002; Hall et al., 2001; Dalley et al., 2002; Ito et al., 2004). Our results may suggest that drug-induced induction of ΔFosB in the NAc may be one mechanism by which behavioral control is enhanced in these procedures. It is also possible that pavlovian conditioned stimuli, acting as conditioned reinforcers, contribute to the present behavioral effects. Enhanced control over behavior by such conditioned stimuli mediated by increases in striatal ΔFosB may also contribute to the effect of the protein on drug-induced conditioned place preference (Kelz et al., 1999; Zachariou et al., 2006) and progressive ratio responding for cocaine (Colby et al., 2003). Alterations in motivational processes have been hypothesized to contribute to the development and the maintenance of addictive behavior (Robinson and Berridge, 1993; Jentsch and Taylor, 1999; Robbins and Everitt, 1999; Nestler, 2004). The present data are also consistent with other theories that emphasize multiple instrumental and pavlovian processes in addictive behavior (Everitt and Robbins, 2005). Additional work is now needed to define the role of drug- and ΔFosB-induced neuroadaptations in NAc and other limbic-striatal subregions with respect to the specific associative or motivational factors that may facilitate instrumental performance and contribute to compulsive behavior. Although the precise molecular mechanisms by which changes within the NAc influence behavior motivated by primary or conditioned reinforcers are not known (Kelley and Berridge, 2002), the GABAergic medium spiny neurons of the NAc are considered a critical substrate for drug- and experience-dependent plasticity. Here, dopaminergic input from the ventral tegmental area and glutamatergic input from corticolimbic afferents converge onto common dendrites and dendritic spines (Sesack and Pickel, 1990; Smith and Bolam, 1990). Chronic psychostimulant exposure increases the density of such spines on neurons in the NAc shell and core (Robinson and Kolb, 1999; Robinson et al., 2001; Li et al., 2003, 2004). Recently, the induction of behavioral sensitization was associated specifically with an increase in dendritic spines within the NAc core (Li et al., 2004). Notably, cocaine-induced increases in spine density persist only in D1-positive neurons that coexpress ΔFosB (Robinson and Kolb, 1999; Lee et al., 2006). ΔFosB in the NAc core may thus contribute to lasting synaptic plasticity that could impact on instrumental behavior. Indeed, a critical role for dopamine-glutamate neurotransmission (Smith-Roe and Kelley, 2000), protein kinase A activity (Baldwin et al., 2002a), and de novo protein synthesis (Hernandez et al., 2002) within the NAc core on instrumental performance have previously been reported. We now identify ΔFosB as a transcription factor that can persistently enhance food-reinforced responding when overexpressed in the NAc core. The specific genes or proteins involved in these effects remain to be precisely defined. ΔFosB regulates the expression of multiple proteins in the NAc involved in neuroplasticity (McClung and Nestler, 2003). A recent microarray analysis characterized gene expression patterns in the NAc of the bitransgenic mice expressing ΔFosB used here, and identified a subset of genes that were regulated by relatively short-term expression of ΔFosB (McClung and Nestler, 2003). BDNF was one such gene, and BDNF in this neural circuit is known to enhance responding for drug- and food-associated cues (Horger et al., 1999; Grimm et al., 2003; Lu et al., 2004). An additional gene of interest is cyclin-dependent kinase 5 (Bibb et al., 2001), which is also induced by ΔFosB, and can regulate both the cocaine-induced structural plasticity (Norrholm et al., 2003) and motivation measured by progressive ratio responding for natural or drug reinforcers (J. R. Taylor, unpublished observations). Still additional candidates are the GluR2 subunit of AMPA glutamate receptors (Kelz et al., 1999) and the transcription factor NFκB (nuclear factor κB) (Ang et al., 2001). It would be important to evaluate these and other regulated proteins in NAc subregions as candidates for mediating the behavioral effects of ΔFosB on instrumental performance and motivation. The present series of experiments provides evidence that overexpression of ΔFosB within the NAc can enhance food-motivated behavior and thereby regulate instrumental performance, as has previously been shown for drug rewards. These data provide new evidence that ΔFosB may act as a general molecular switch associated with enhancements in the motivational aspects of reinforcers on goal-directed behavior. Our findings raise the possibility that induction of NAc ΔFosB by, for example, addictive drugs, stress, or perhaps highly rewarding foods, may be a critical mechanism by which dysfunctional motivational states result in psychiatric disorders associated with compulsive behavior. This work was supported by grants from the National Institute on Drug Abuse, the National Institute of Mental Health, and the National Institute of Alcohol Abuse and Alcoholism. We gratefully acknowledge the valuable assistance of Dilja Krueger, Drew Kiraly, Dr. Ralph DiLeone, Robert Sears, and Dr. Jonathan Hommel at the Department of Psychiatry, Yale University. We are also grateful to Dr. Jennifer Quinn and Dr. Paul Hitchcott for providing helpful comments on this manuscript. (2001) Induction of NFκB in nucleus accumbens by chronic cocaine administration. J Neurochem 79:221–224. (2002b) Appetitive instrumental learning requires coincident activation of NMDA and dopamine D1 receptors within the medial prefrontal cortex. J Neurosci 22:1063–1071. (1994) Effects of ibotenic acid lesions of the nucleus accumbens on instrumental action. Behav Brain Res 65:181–193. (2003) Parsing reward. Trends Neurosci 26:507–513. (2006) beta2-Subunit-containing nicotinic acetylcholine receptors are involved in nicotine-induced increases in conditioned reinforcement but not progressive ratio responding for food in C57BL/6 mice. Psychopharmacology (Berl) 184:328–338. (2006) Mice with chronically elevated dopamine exhibit enhanced motivation, but not learning, for a food reward. Neuropsychopharmacology 31:1362–1370. (1998) Regulation of cocaine reward by CREB. Science 282:2272–2275. Transgenic animals with inducible, targeted gene expression in brain. Mol Pharmacol 54:495–503. (2003) Striatal cell type-specific overexpression of ΔFosB enhances incentive for cocaine. J Neurosci 23:2488–2493. (2002) Nucleus accumbens dopamine and discriminated approach learning: interactive effects of 6-hydroxydopamine lesions and systemic apomorphine administration. Psychopharmacology (Berl) 161:425–433. (2002) Effects of cytotoxic nucleus accumbens lesions on instrumental conditioning in rats. Exp Brain Res 144:50–68. (2004a) Direct interactions between the basolateral amygdala and nucleus accumbens core underlie cocaine-seeking behavior by rats. J Neurosci 24:7167–7173. (2004b) Conditioned reinforcing properties of stimuli paired with self-administered cocaine, heroin or sucrose: implications for the persistence of addictive behaviour. Neuropharmacology 47([Suppl 1]) 202–213. (1985) Actions and habits: the development of behavioural autonomy. Philos Trans R Lond B Biol Sci 308:67–78. (2005) Neural systems of reinforcement for drug addiction: from actions to habits to compulsion. Nat Neurosci 8:1481–1489. (2003) Time-dependent increases in brain-derived neurotrophic factor protein levels within the mesolimbic dopamine system after withdrawal from cocaine: implications for incubation of cocaine craving. J Neurosci 23:742–747. (2001) Involvement of the central nucleus of the amygdala and nucleus accumbens core in mediating Pavlovian influences on instrumental behaviour. Eur J Neurosci 13:1984–1992. (1998) Enhanced appetitive conditioning following repeated pretreatment with d-amphetamine. Behav Pharmacol 9:299–308. (2002) Early consolidation of instrumental learning requires protein synthesis in the nucleus accumbens. Nat Neurosci 5:1327–1331. (1990) Preexposure sensitizes rats to the rewarding effects of cocaine. Pharmacol Biochem Behav 37:707–711. (1992) Preexposure to amphetamine and nicotine predisposes rats to self-administer a low dose of cocaine. Psychopharmacology (Berl) 107:271–276. (1999) Enhancement of locomotor activity and conditioned reward to cocaine by brain-derived neurotrophic factor. J Neurosci 19:4110–4122. (2004) Differential control over cocaine-seeking behavior by nucleus accumbens core and shell. Nat Neurosci 7:389–397. (1994) Amphetamine regulates gene expression in rat striatum via transcription factor CREB. J Neurosci 14:5623–5634. (2006) Cocaine-induced dendritic spine formation in D1 and D2 dopamine receptor-containing medium spiny neurons in nucleus accumbens. Proc Natl Acad Sci USA 103:3399–3404. (2003) Regulation of gene expression and cocaine reward by CREB and ΔFosB. Nat Neurosci 6:1208–1215. (2004) ΔFosB: a molecular switch for long-term adaptation in the brain. Brain Res Mol Brain Res 132:146–154. (2004) Conditioned activity and instrumental reinforcement following long-term oral consumption of cocaine by rats. Behav Neurosci 118:1331–1339. (2004) Molecular mechanisms of drug addiction. Neuropharmacology 47([Suppl 1]) 24–32. (2003) Cocaine-induced proliferation of dendritic spines in nucleus accumbens is dependent on the activity of cyclin-dependent kinase-5. Neuroscience 116:19–22. (2003) Repeated nicotine exposure enhances reward-related learning in the rat. Neuropsychopharmacology 28:1264–1271. (2004) Repeated nicotine exposure enhances responding with conditioned reinforcement. Psychopharmacology (Berl) 173:98–104. (1999) Dissociation in effects of lesions of the nucleus accumbens core and shell on appetitive pavlovian approach behavior and the potentiation of conditioned reinforcement and locomotor activity by d-amphetamine. J Neurosci 19:2401–2411. (2002) Nucleus accumbens dopamine depletion impairs both acquisition and performance of appetitive Pavlovian approach behaviour: implications for mesoaccumbens dopamine function. Behav Brain Res 137:149–163. (1986) The rat brain in stereotaxic coordinates (Academic, Sydney). (2004) Induction of ΔFosB in reward-related brain structures after chronic stress. J Neurosci 24:10594–10602. (1990) Stress- and pharmacologically-induced behavioral sensitization increases vulnerability to acquisition of amphetamine self-administration. Brain Res 514:22–26. (1997) Common neural substrates for the addictive properties of nicotine and cocaine. Science 275:83–86. (1993) The neural basis of drug craving: an incentive-sensitization theory of addiction. Brain Res Brain Res Rev 18:247–291. (2001) Cocaine self-administration alters the morphology of dendrites and dendritic spines in the nucleus accumbens and neocortex. Synapse 39:257–266. (1990) In the rat medial nucleus accumbens, hippocampal and catecholaminergic terminals converge on spiny neurons and are in apposition to each other. Brain Res 527:266–279. (2003) Regulation of CRE-mediated transcription in mouse brain by amphetamine. Synapse 48:10–17. (1990) The neural network of the basal ganglia as revealed by the study of synaptic connections of identified neurones. Trends Neurosci 13:259–265. (1999) Enhanced responding for conditioned reward produced by intra-accumbens amphetamine is potentiated after cocaine sensitization. Psychopharmacology (Berl) 142:31–40. (2001) Repeated intermittent administration of psychomotor stimulant drugs alters the acquisition of pavlovian approach behavior in rats: differential effects of cocaine, d-amphetamine and 3,4-methylenedioxymethamphetamine (“Ecstasy”) Biol Psychiatry 50:137–143. (2002) Sensitization of midbrain dopamine neuron reactivity promotes the pursuit of amphetamine. J Neurosci 22:4654–4662. (2001) Incentive sensitization by previous amphetamine exposure: increased cue-triggered “wanting” for sucrose reward. J Neurosci 21:7831–7840. (2006) An essential role for ΔFosB in the nucleus accumbens in morphine action. Nat Neurosci 9:205–211.